Investors love stocks that consistently beat the Street without getting ahead of their fundamentals and risking a meltdown. The best stocks offer sustainable market-beating gains, with robust and improving financial metrics that support strong price growth. Does BlackBerry (NYSE:BB) fit the bill? 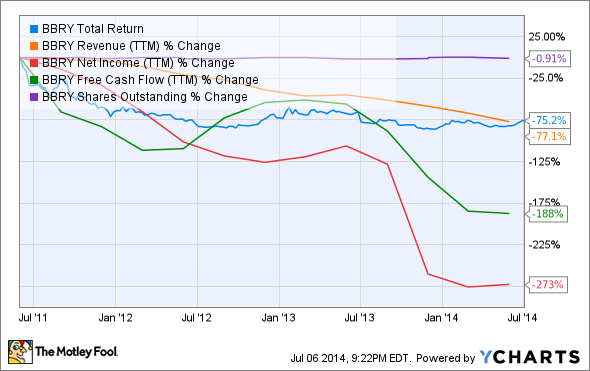 Let's look at what its recent results tell us about its potential for future gains. BBRY Total Return Price data by YCharts. Source: YCharts. * Period begins at end of Q1 (May) 2011. 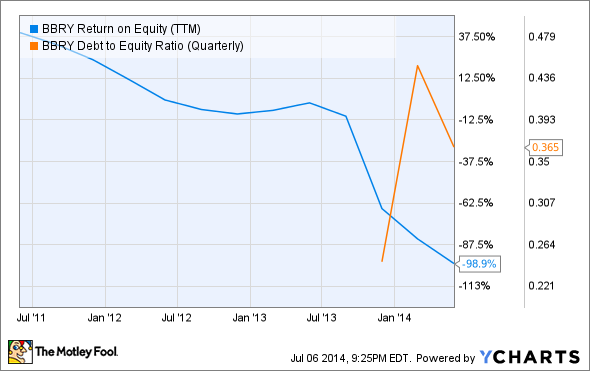 BBRY Return on Equity (TTM) data by YCharts. BlackBerry has been the poster child for yesterday's technology for some time, but it slipped even farther from its underwhelming 2013 score to earn no passing grades at all in its second assessment. The BlackBerry "turnaround" has been an ongoing story for some time, but simply cutting costs has not done anything to boost the once-dominant smartphone maker's fortunes. Is there something behind the hoped-for second coming of BlackBerry? Will consumers and the market completely abandon the Canadian smartphone maker's devices in favor of Apple (NASDAQ:AAPL) and Google (NASDAQ:GOOG) (NASDAQ:GOOGL) Android devices, which now comprise a nearly indomitable duopoly in the market BlackBerry once dominated? Let's dig a little deeper to find out what lies ahead. Investors have gotten a wild ride on BlackBerry shares this year, from a quick surge to a near-50% gain in January to a complete collapse back to zero following underwhelming earnings and an end to its carrier relationship with T-Mobile, only to enjoy a second rebound after a surprising fiscal first quarter made "turnaround" again the word of the year for a company many had left for dead. BlackBerry has all but admitted that it will never again be a leader in hardware, which brought in only 39% of the first quarter's top line, compared to 54% from services. This is despite an improvement in unit sales, from 1.3 million in the fourth quarter to 1.6 million in the first. The company even managed to improve its balance sheet, reducing long-term debt while simultaneously boosting cash on hand thanks to painful cost reductions that trimmed expenses by 60% in just three months. BlackBerry's Messenger app has become one of the company's biggest opportunities, a secure enterprise-focused messenger for businesses that don't feel comfortable with their employees communicating through iOS' or Android's default messaging apps. In keeping with its (long-overdue) shift toward software, BlackBerry has also paired with Amazon.com to offer Amazon's Appstore on BB10 phones. This helps address a glaring discrepancy between the variety of apps on BlackBerry's native platform and the millions on the iOS App Store or on Google Play, but Fool writer Adam Levine-Weinberg doesn't expect this deal to help the BB10 platform, which has failed to gain traction since its launch and which seems to have been set as an inferior smartphone option in most consumers' minds. More apps might give existing BB10 owners more to do with their phones, but they probably won't entice buyers looking for smartphones that will work well with their increasingly diverse collection of connected devices. While BlackBerry may never be a smartphone leader, its technological aptitude could lead to success in other fields. The company's new strategy, focusing on secure enterprise services, has led it to invest in a health-care network and to develop something called Project Ion, which is an effort to establish leadership in the burgeoning Internet of Things. BlackBerry's secure software expertise is well suited for deploying a vast network of connected things that won't be susceptible to hacking. Project Ion is not yet developed enough for investors to do more than gamble on its potential -- but if BlackBerry becomes a leading software supplier for the Internet of Things, it could certainly reach heights not seen since pre-iPhone days. Today BlackBerry has few of the qualities that make up a great stock, but no stock is truly perfect. Digging deeper can help you uncover the answers you need to make a great buy -- or to stay away from a stock that's going nowhere.